Black Hole Crew: Okkultokrati - Haust: Download the new HAUST song "NO CHRISTMAS" for free! Download the new HAUST song "NO CHRISTMAS" for free! Update: This show is tomorrow Oslo yobos! It will be packed, get there early. 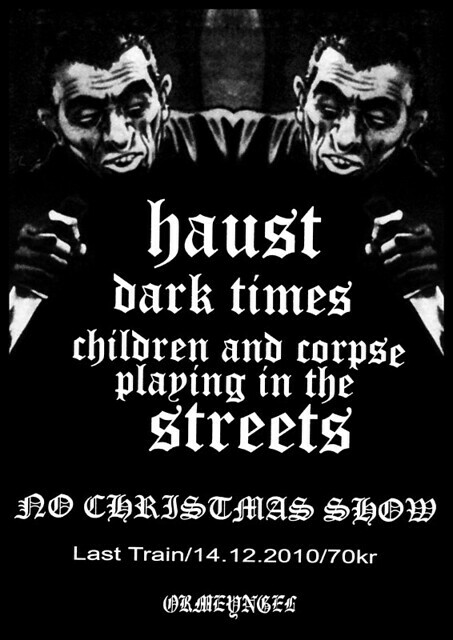 You should be able download the new Haust track "No Christmas" HERE. It's an instant classic. Probably the best song made all year. In late December it's perfect to shut yourself in in a dark room and watch movies. Some recommendations: Black Christmas (the original from 1974), Silent Night, Deadly Night, Silent night, bloody night, You better watch out aka Christmas Evil and of course, Gremlins, and How the Grinch Stole Christmas. For who hasn't felt like Boris Karloff in the animated Grinch costume around these times? The grim Christmas, with its assumed good mood and arrogant rich man's escapism can scare away even the best. So banish evil with evil. Watch a good horror movie and enjoy the holidays!